CamRandom Chat is another chat roulette site. When you enter to main page, you can start to chat with strangers immediately. If you are a girl you can find many partners in site but if you are man, it will be very hard to find a girl partner for you. There’s no age limit or no registration requirements for chat roulette. If you want to find any girl at CamRandom chat, there are some options for you. You can click on “Chat With Girls” button and you may start to chat with girls. A registration will be required for chatting with girls. 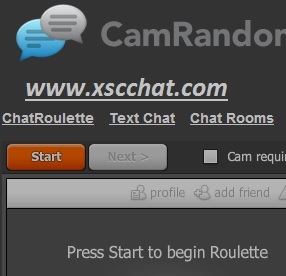 CamRandom is looking like other chat roulette sites. There are also other options like Text Chat, Chat Rooms and Gay Chat… If you prefer partners with camera, you can tick on “Cam Required”. CamRandom language is in English and you should know English to join chat at CamRandom Chat.